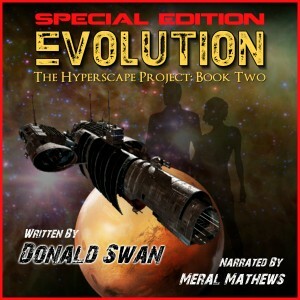 Evolution is book 2 in the Hyperscape series, and it’s another great, fun science fiction adventure story. It begins a few months after where book 1 leaves off, with Nick Bannon now Admiral of the fleet as they battle the bio-mechanical Mok’tu. Arya is now the recognized Asirian queen. At first I was worried she would be relegated to the side because of this, but Arya isn’t one to allow herself to become a inactive character. My favorite character, Karg, has a strong storyline in this book, and Sirok is in it as well.With the original ‘cast’ assembled, Swan leads readers on a wild, entertaining and action-packed ride as Nick struggles to bring an end to the Mok’tu, fulfill the roll of a prophecy he doesn’t believe in, keep the fleet together and keep Arya out of too much trouble. There’s a side-story with Karg and his past I loved learning about, though some of the exposition with Karg and Trol was a bit long. 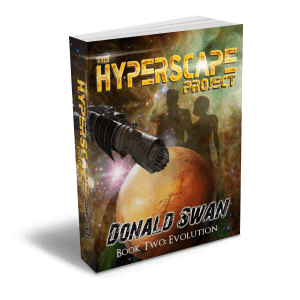 Added to this are a few unexpected twists as Hypserscape ventures into the realms of multi-verse sci-fi. Suitable for science fiction adventure fans of all ages, there is a lot of action in this book – almost too much, and that’s where it lost a star with me. I felt the action and adventure overshadowed the story and character development at times. The “out of pot and into the fire” pacing, from one crazy action scene to the next, left me a little breathless at times and confused in others. A younger audience, or those who love high-adventure, will enjoy this aspect more than I did. It was still a highly enjoyable read for me, and I am very much looking forward to book 3!